The secret to this flavor is that - there are no secrets. Only real Parmesan cheese, garlic and parsley, baked right into the dough. 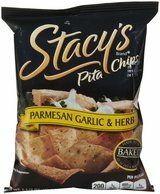 Try them with a delicious, spicy spinach dip. Or try them straight out of the bag. Either way, you'll thank us for demanding only premium ingredients.